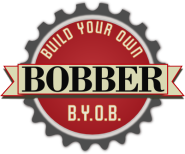 For the last post in this three-part series (see the first two posts here and here), I have a round-up of a few more fun tools and gadgets that make a great addition to any bike shop. 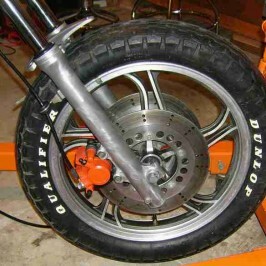 Tire Changer with Bead Breaker and Tire Changing Tools (below): Anyone out there like changing tires? Tire changing is an art form if you’re doing it by hand, and it’s honestly not my favorite thing with old bikes that have been sitting for years. Those old tires grow hard and end up with the flexibility of a rock, which makes it hard to break the bead and pull the tire from the rim, unlike new soft tires. Well, an effective bead breaker is just plain essential to changing a tire. The Stubby Tire Tools grab the tire easier and hold it better than other tire irons and spoons that I’ve used. This set of tools make a big difference and save me loads of time and energy. 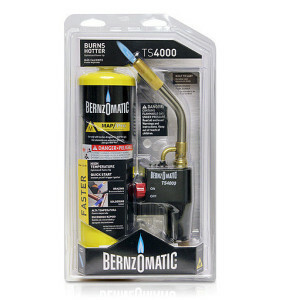 MAPP torch: MAPP gas operates at a higher temperature than propane and is useful for quickly connecting copper fittings, stripping paint, brazing, soldering and similar tasks. To be precise, true MAPP gas (methylacetylene-propadiene propane) isn’t available and hasn’t been since 2008. There was only one plant in North America that produced it and it was shut down in the spring of 2008. These days, products labeled as “MAPP” are, in fact, MAPP substitutes. The most common is map-pro gas which is stabilized liquefied petroleum gas which high levels of propylene. For this post, I’ll just use the term MAPP (even though it isn’t real MAPP gas). In addition to the plant shutdown, a voluntary recall of over 30 million gas cylinders began in February 2012, including MAPP gas cylinders. 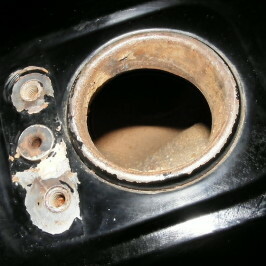 It was determined that the seal on the gas cylinders could leak after torches were disconnected, posing a fire hazard. Perhaps more to the point, there were also reports of injuries involving a faulty fracture groove. In other words, between the plant shutdown in 2008 and the recall of cylinders in 2012 (and other litigation), there should be no true MAPP gas cylinders available today…except for the two partially filled MAPP gas cylinders that are in my shop. 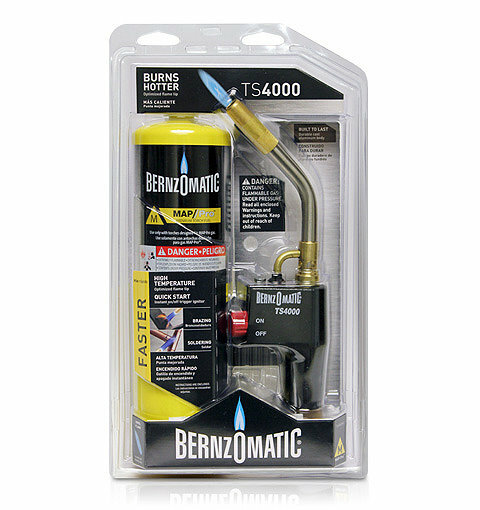 Bernzomatic TS4000 Torch: Mainly for heating metal so it can be bent and formed. 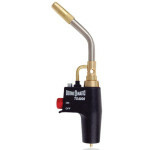 Several features make the torch easy to use. For instance, there’s a lock button which keeps the torch lit for finger-free use. The burn tip produces a swirl flame for maximum heat output which is more efficient than a pencil flame. 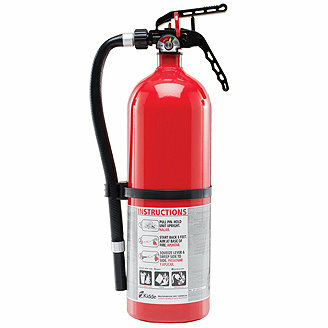 Fire extinguisher (below): I have one of these close at hand. Because a typical garage/shop stores many kinds of material, a multipurpose ABC fire extinguisher is a good bet. It will fight all types of fire — trash, wood, paper, liquids, and electrical equipment. 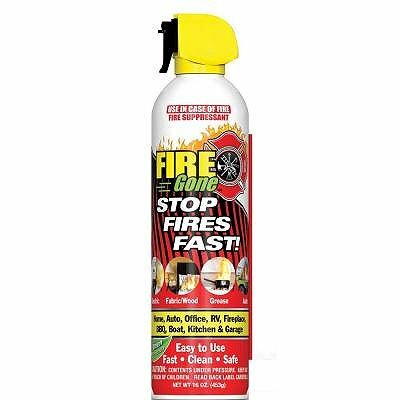 Fire Gone Fire Suppressant (below): In addition to an extinguisher, there are cans of this strategically placed around the shop. For instance, a can of fire suppressant on the welding cart and a can near the bench vise where grinding sparks are flying around seems like a good idea to me. There is one caveat about the fire suppressant. The manufacturer says it is “ideal for use in your … garage…car…” It’s ironic however that the can also has a warning about extreme temperatures including a warning to avoid freezing. Well, if you keep the suppressant in your car or in your garage, it’s going to experience extreme temperatures. So, I’m not sure which is correct. Is it ideal for the car and garage? Or, is it less than ideal due to certain temperature conditions? Eastwood MIG 135 Welder: This welding machine will weld mild and stainless steel, 24-gauge to 1/4″ on standard 120v household current with infinitely adjustable wire speed and heat settings. I hope it’s not needed, but the Eastwood comes with a 3-year “no hassle” warranty. 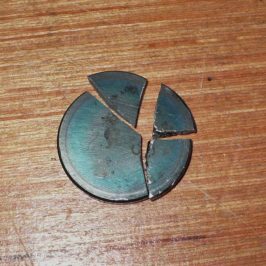 When buying an air compressor for sandblasting, the mantra was bigger is better…buy the most power that you can afford and don’t skimp. That’s not the case with welding machines. Here, I’m buying what gets the job done. I’m not paying for power that I won’t use or need. So, yes, there are machines that put out more power than this humble and capable Eastwood 135. It doesn’t matter. And, yes, there are machines that carry THE brand name(s), but I don’t pay a premium for a brand. Again, I’m speaking for me and only me. Everyone in this great country of ours has the ability to buy what they choose based on their wants and needs. It’s great, isn’t it? 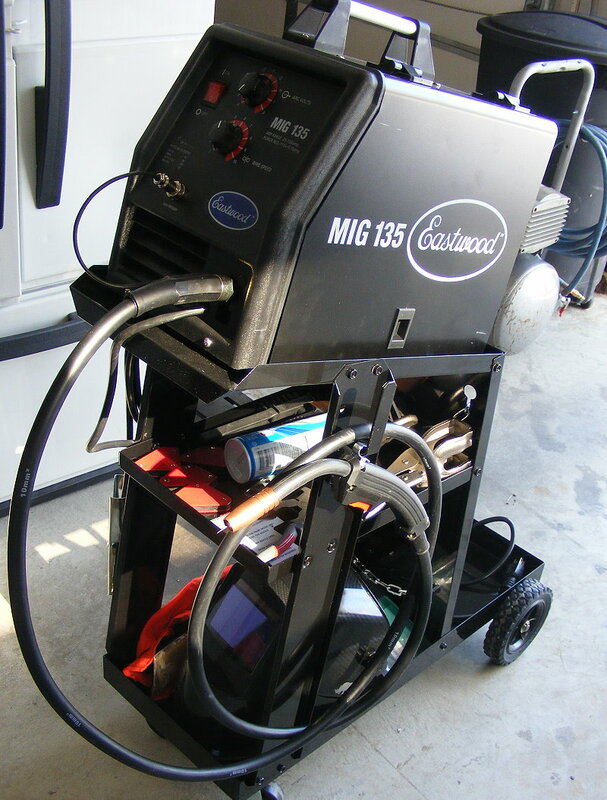 Welding Cart (below): To hold and maneuver the welder, I snagged a cart from Harbor Freight. 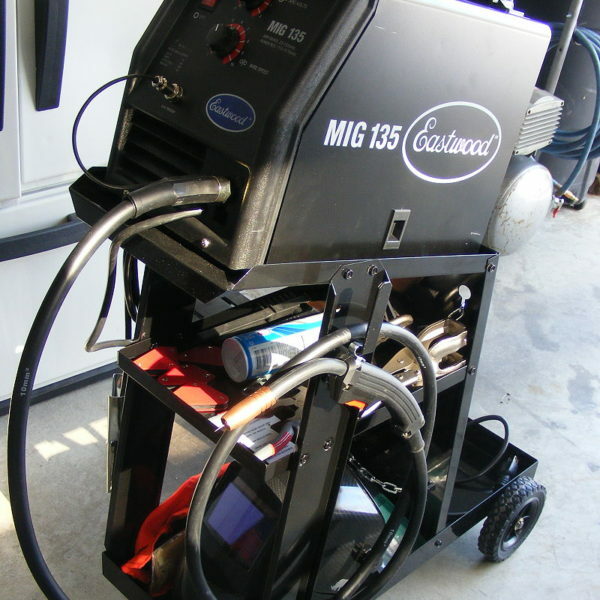 I have no experience with welding carts, but this one was inexpensive compared to others and looked a whole lot like those other carts that sellfor twice the price. Other than that, what’s to say? 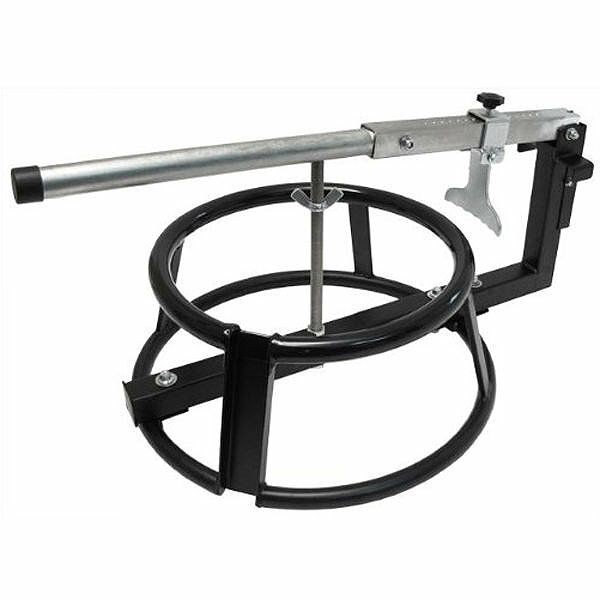 It has wheels that work and make it easy to situate the welder in place. It has shelves to hold tools, consumables and what-not. When putting it together, I thought it might be a little rickety but it has a better feel once it’s together. 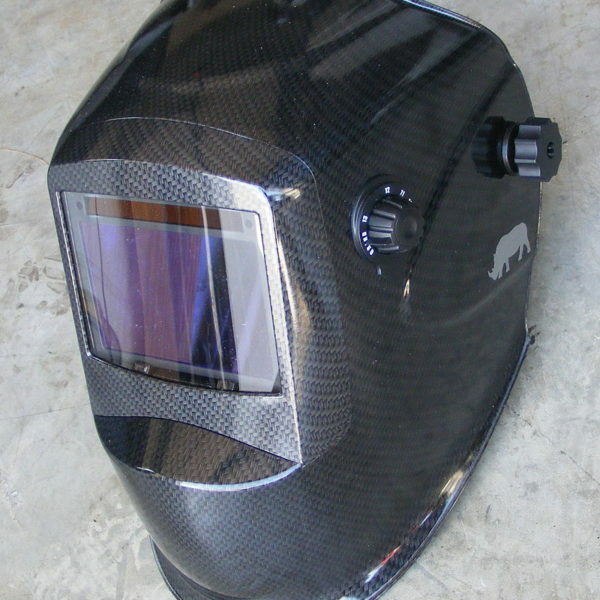 If I were welding every day, I’d want something sturdier, but for my shop, this one’s just fine. 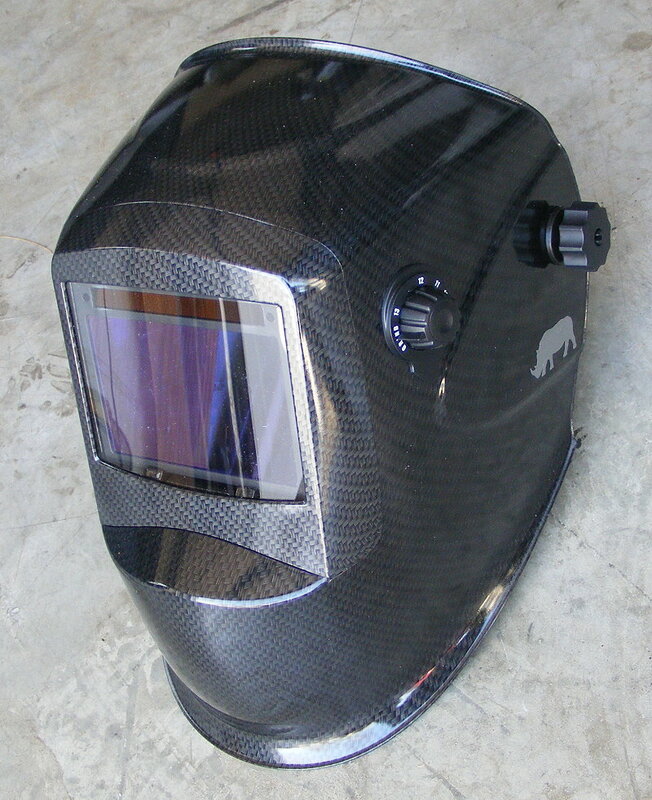 Rhino Welding Helmet (below): Taking up shelf space on the cart is this cool helmet. It’s auto-darkening with a large view lens. The large lens is a good feature because I’m blessed with tri-focal eyeglasses. 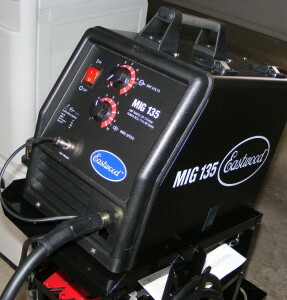 It also has a grinding mode that will come in handy at times. I’m not interested in buying a cheapo helmet and getting flashed on a regular basis. Not fun. 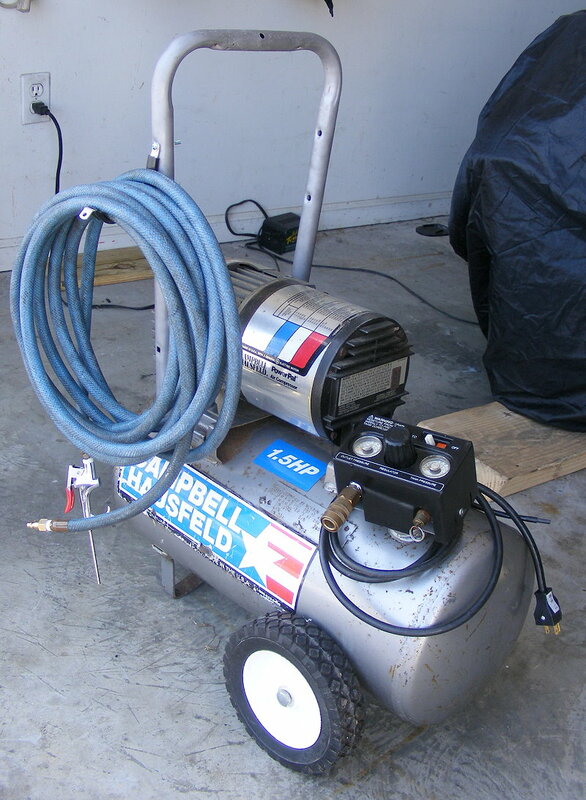 Campbell Hausfeld Air Compressor: If you read my earlier post about my sandblasting rig, you already know about this little compressor that I picked up cheap on craigslist. I got it to save myself the trouble of running 100 feet of line from my basement to my garage. It’s an older portable 1.5 HP that runs on household 120v. 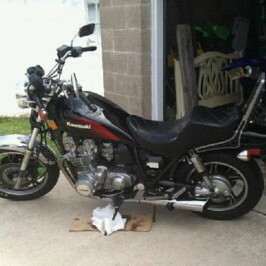 It’s rated 3 CFM at 90psi and 4 at 40psi. The plan is to utilize it for sodablasting. 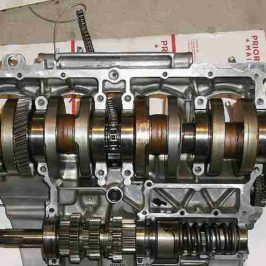 If it works, it will be a great addition for scouring and brightening the engine. 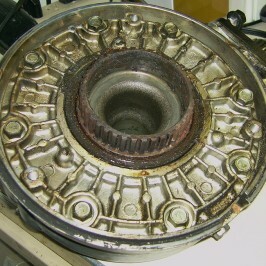 Now, the performance numbers on this compressor may seem to be too low for sodablasting. But, this article by Eastwood leads me to believe that it will work. 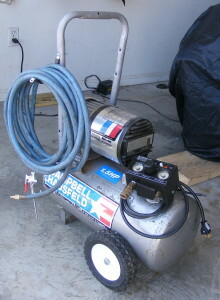 On the media-feeding side of this rig, there’s an excellent Sandblasting Kit by Campbell Hausfeld for twenty bucks. It draws the abrasive media from a bucket or a bag making it easy to use. And a search led me to a business close by that sells 50 lbs. of sodium bicarbonate for $13.90. Can’t beat that! In any event, if the sodablasting thing doesn’t work, I have an air compressor that will drive air tools for the garage…no problem. Oh man, here’s the perfect excuse to buy more tools, especially since I don’t have one air tool yet. Where’s that Harbor Freight flyer…is it time for a road trip to Eastwood in Pottstown? I’m sure I can find space for just a few more tools.